These high quality Custom Imprinted Wine Glasses are perfect for restaurants, fraternities/sororities, military organizations, non-profits, promotions, and much more. 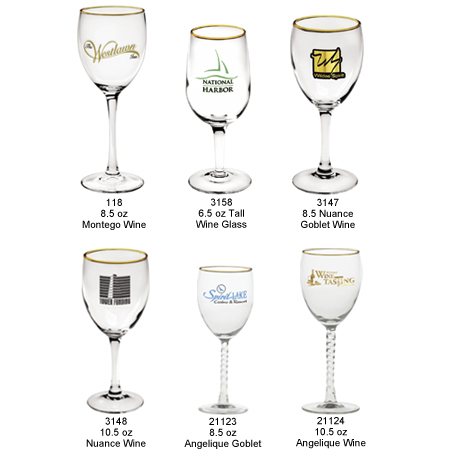 You can choose from nearly two dozen different Custom Imprinted Wine Glass styles, ranging in size from 6.5 ounces to 18 ounces. We use a kiln-fired imprinting process – at heats up to 1,200 degrees – to ensure that your imprinted design is durable and long-lasting. Your satisfaction is guaranteed when you order Custom Imprinted Wine Glasses from us. 118 8.5 oz Montego Wine Glass $3.75 $3.36 $3.22 $3.12 $3.02 $2.81 1-1/8" 2-3/4"
3158 6.5 oz Tall Wine Glass $2.64 $2.29 $2.19 $2.12 $2.06 $1.92 1-5/16" 2-1/8"
3147 8.5 oz Nuance Goblet $3.06 $2.69 $2.58 $2.50 $2.42 $2.25 1-1/16" 2-13/16"
3148 10.5 oz Nuance Wine $3.06 $2.69 $2.58 $2.50 $2.42 $2.25 1-1/16" 2-13/16"
21123 8.5 oz Angelique Goblet $3.80 $3.39 $3.25 $3.15 $3.05 $2.84 1-5/16" 2-13/16"
21124 10.5 oz Angelique Wine $3.80 $3.39 $3.25 $3.15 $3.05 $2.84 1-1/8" 2-13/16"